The two most recent Mill Creek Residential projects inaugurated this year – Modera Dadeland and Modera Riverhouse – counted on PENETRON crystalline technology to solve issues related to a high-water table. Mill Creek Residential Trust develops, builds and operates apartment communities in urban areas across the USA. With tens of thousands of residential units under management, Mill Creek engineers and project managers deal with a wide range of construction hurdles. Many of these communities are in South Florida, including Modera Coral Gables, Modera Port Royale, Modera Douglas Station, Modera Pembroke Pines, and Alister Boca Raton in Boca Raton, Ft. Lauderdale, and Miami – all successful Penetron projects. When confronted with the challenging ground water situation (and the resulting hydrostatic pressure) common in the Miami, Florida, area, the company works with Penetron to come up with a waterproofing solution that can be easily – and cost-effectively – applied to a project. In the past, a bentonite membrane was often specified as a standard solution to waterproof below-ground concrete structures. 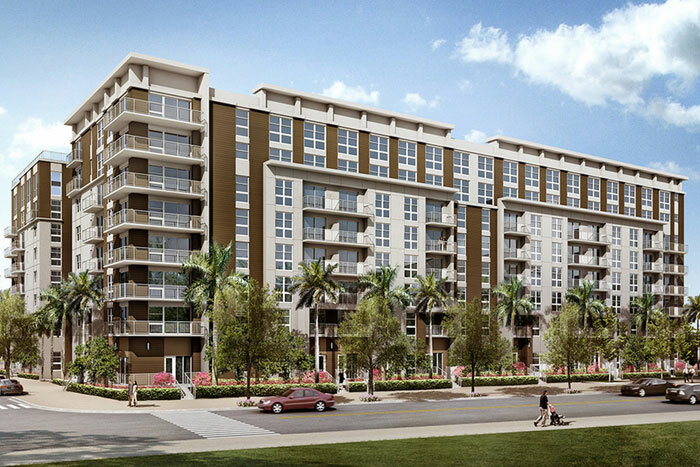 For the two most recent Mill Creek projects – Modera Dadeland and Modera Riverhouse – PENETRON technology was applied to solve issues of high groundwater. A mixed-use community of 422 apartment homes and penthouses in a 25-floor tower, the Modera Metro Dadeland project offers studio, one-, two-, and three-bedroom units. The upscale community offers amenities such as rooftop decks and barbecue areas, as well as a landscaped park, pet spa, underground parking garage, and elevated swimming pool. Additional features include a 24-hour fitness studio, clubhouse, café, conference room, game room and theater room. Located close to the Snapper Creek Canal, the construction site had a high groundwater level, with many spots completely waterlogged. The project owner and CEMEX, the ready-mix supplier, contacted Penetron about the right waterproofing product to enable placement of concrete at the site. CEMEX treated the concrete for the below-grade elevator pits, the pool structure, and the pool deck with PENETRON ADMIX. The project owner specified the use of PENETRON ADMIX due to both the cost-savings and the time saved in the construction schedule. The 292 luxury apartments of the $53 million Modera Riverhouse project are situated in three buildings, highlighted by an eight-floor tower. The apartments are available as studio, one-, two- and three-bedroom units. The community also features a fitness studio, rooftop pool deck, yoga studio, pet spa, and café. Working at the construction site, a 2.5-acre parcel just north of the Miami River, the general contractor, Orange and Blue, had to deal with a high-water table and considerable water pressure that demanded a reliable waterproofing solution. Titan America, the ready-mix supplier, treated all concrete for the elevator pits and pool structures with PENETRON ADMIX. Once construction was completed and the dewatering station was shut off, the water table rose again, but the concrete structures remained completely dry thanks to the active sealing capabilities of PENETRON ADMIX. As a crystalline admixture, PENETRON ADMIX reacts in a catalytic reaction with moisture in fresh concrete to generate a non-soluble crystalline formation throughout the pores and capillary tracts normally found in concrete. This formation permanently seals microcracks, pores and capillaries against the penetration of water or liquids from any direction, substantially reducing the permeability of usually porous concrete. As an integral waterproofing solution, PENETRON ADMIX provides low permeability, low shrinkage and self-healing properties - a highly effective combination for concrete structures in the high groundwater environments encountered in Southern Florida. “Ultimately, the ease and simplicity of PENETRON ADMIX has helped keep the Mill Creek projects on schedule and save costs when compared to alternate solutions, such as membranes,” concludes Mr. Chen.